Who else watched Kat Von D's 10th-anniversary celebration on Instagram? I know I did and my goodness wasn't it just stunning. To celebrate her brands 10th birthday she brought out a limited edition gold themed 10th-anniversary collection which includes makeup brushes, a highlighter and an eyeshadow palette. 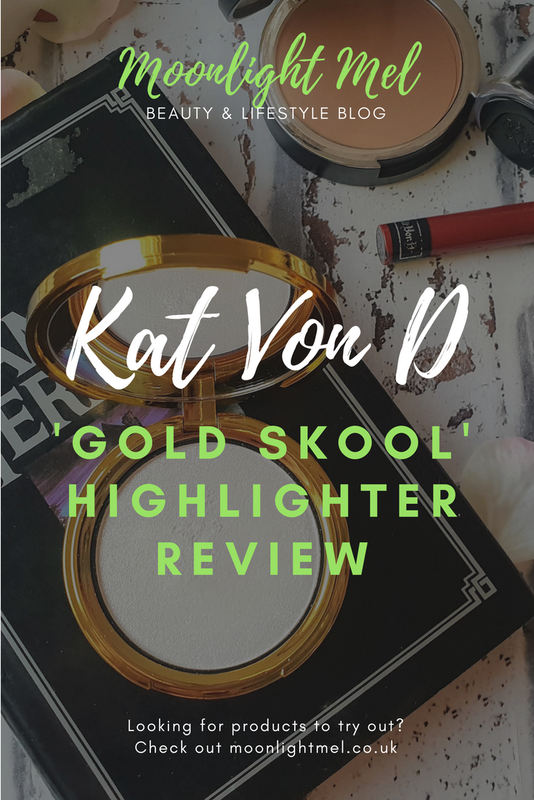 As much as I wanted to buy the whole collection I decided that the sparkly 'Gold Skool' highlighter was the one for me to try; I just love highlighters. 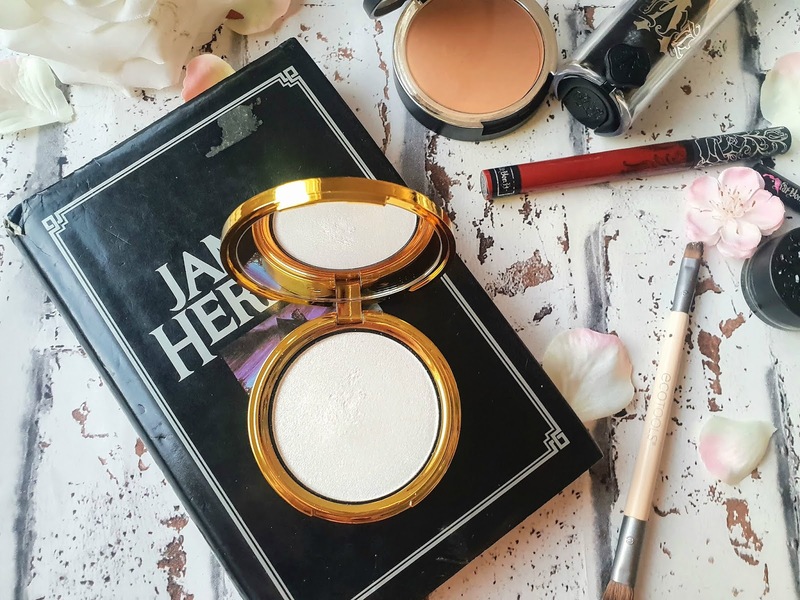 I first tried this highlighter out in Debenhams at the Kat Von D counter. 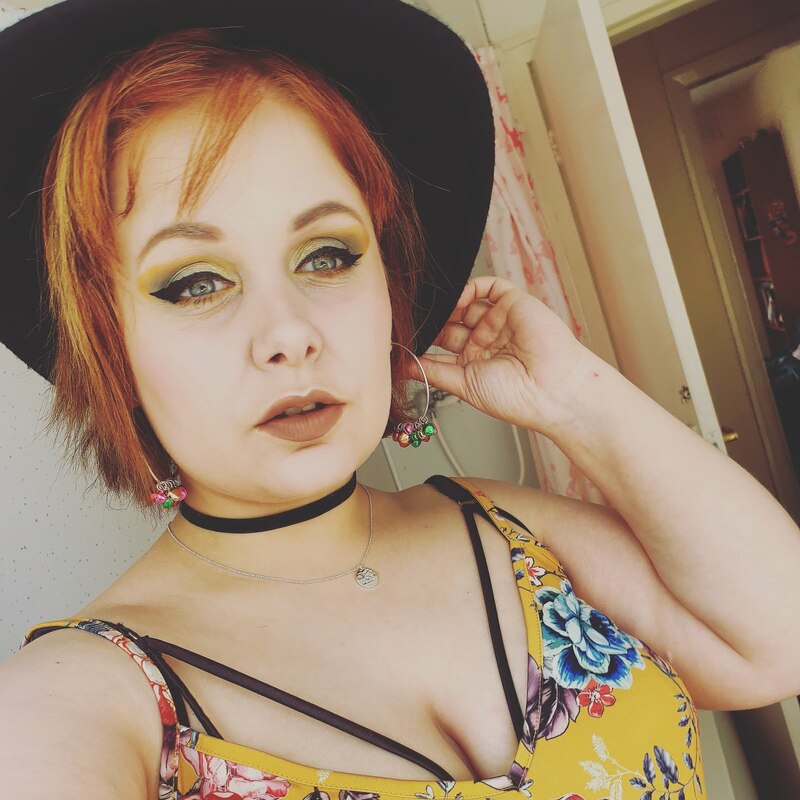 I wanted an all out their vibrant wedding guest look and the staff recommend me lots of amazing products including 'old skool'. Once I saw the sparkle and glow on my skin I just knew I had to have it. The glow this has is like a 24 karat sparkle - it means business. It costs £25, so a little on the expensive side but you do get 4.8g of product and since its a limited edition it can be nice to collect if you like limited edition makeup. The packaging is just stunning and it is beyond words. The 10th Anniversary collection has a gold theme and this highlighter palette is a shimmering gold that reflects light. It comes in a golden box with gold embossed writing on it. 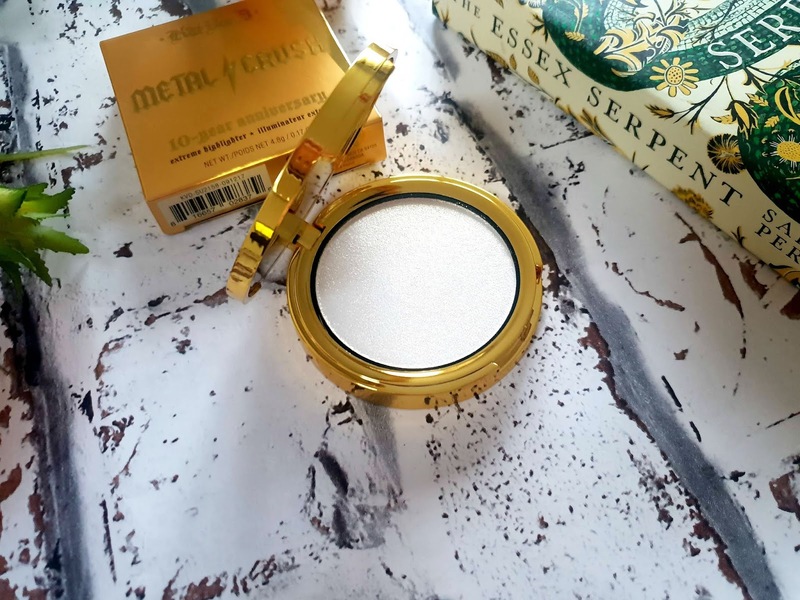 The metal crush highlighter is amazing really it is a powder but it has a liquid-powder finish; so basically it applies smoothly like butter and blends out seamlessly with the micro-crystals that sparkle with every movement. 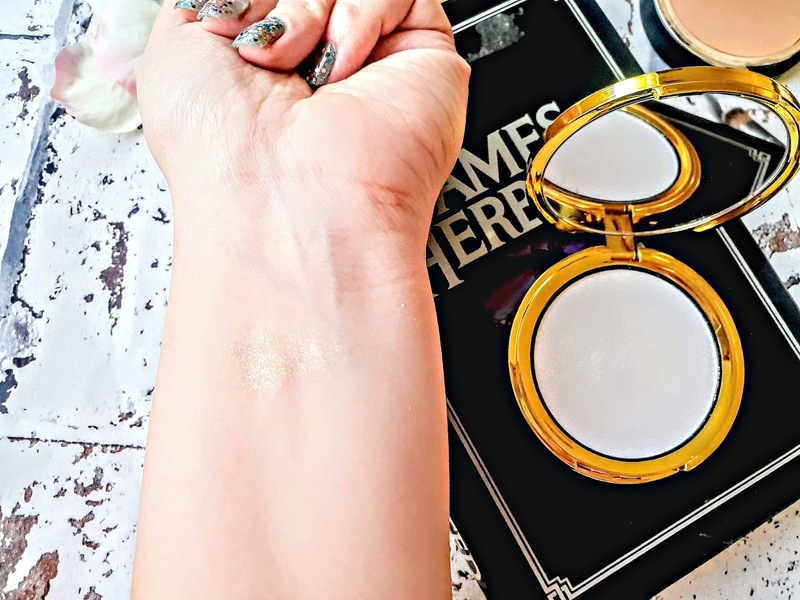 In the pan its a pale white gold shade but once it is on the skin its a lovely golden shade that with every movement can be seen and glistens with its sparkles. Depending on how you apply with depending on the way this highlighter looks. It has a semi-opaque finish and can be made more opaque by simply adding more - like myself in the photo below. Hands down the most long-lasting highlighter I have ever used. I have worn this to a wedding, party and everyday days too - it lasts all day effortlessly without the need for reapplying. 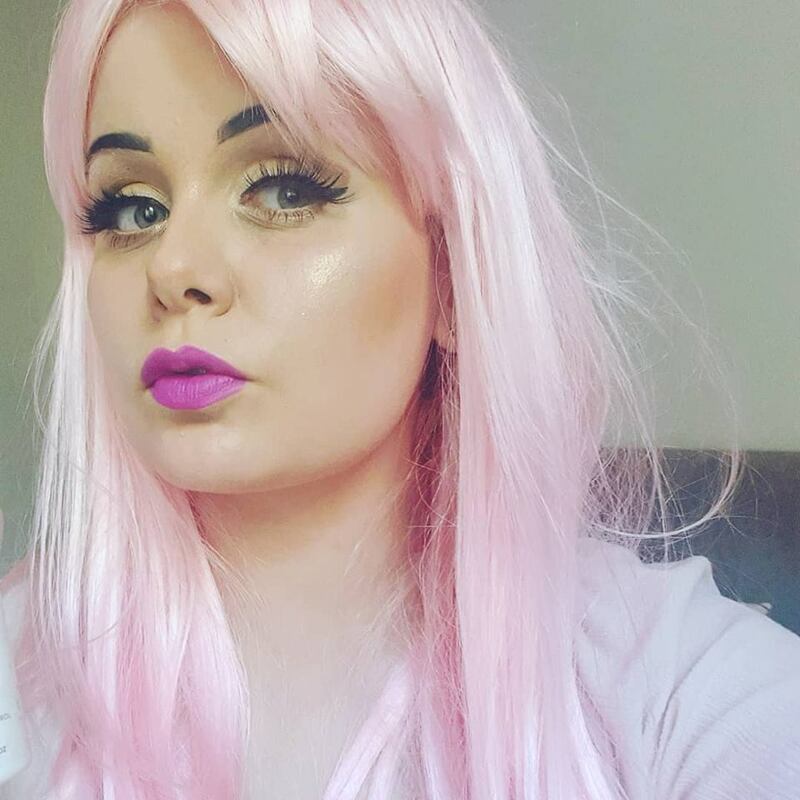 I love 'Old Skool' it is a beautiful highlighter that can be used for day or night looks. It applies effortlessly either with your fingers, highlighter brush or blusher brush depending on how intense you want the highlighter to be. It has very little fallout and the compact has a mirror so its travel-friendly. Not only does 'Old Skool' work well on the cheekbones it applies well on the brow arch, cupids bow or even on your shoulders etc. Have you tried anything from the Kat Von D 10th Anniversary range? Wow - this highlighter looks GORGEOUS! That packaging is also so pretty. It looks like it does such a good job from your picture. I haven't actually tried any of Kat Von D's products, but they always look so pretty! That highlighter looks stunning on you! Well worth the price if it has little fallout and is limited edition! I do love liquid highlighter finishes, I’ve never bought one but I always swatch them whenever I go into Boots! You and your blog look great! Thanks for the detailed review.